Dr. Sheila Ramgopal, one of Pittsburgh’s foremost abortion providers, finds her peace through empowering women — and she’s just getting started. From the outside, it’s hard to tell that Allegheny Reproductive Health Center is an abortion clinic. The red brick building on Kirkwood Street in East Liberty has flowers in the window and the name of the clinic in small-set plain white text on the door. Past the security guard in the foyer is a long hallway that opens onto a waiting area before the doors to the clinic’s main workstation. Doctors and nurses hurriedly prepare the clinic’s procedural rooms to care for the women waiting in the halls. “See? It’s just like what you’d see in any outpatient clinic. Nothing scary,” Dr. Sheila Ramgopal, the owner of the clinic, said. The only things distinguishing the rooms as gynecological procedural rooms are the stirrups on the examination tables and the aspiration machines for performing some types of abortions. Ramgopal, a 37-year-old OB-GYN who sports a tight mohawk and tattoos, quickly explained the clinic was quite busy that day and that she had to go. After she left Allegheny Reproductive that night, she’d be off to work at one of six locations her other job as a resident OB-GYN takes her, including classrooms at the University of Pittsburgh medical school as Pitt faculty. Some nights she heads to her office practice at Magee-Womens Hospital in Oakland. Other evenings she goes to Planned Parenthood Downtown to volunteer or heads out to a women’s health clinic in Wilkinsburg. She’s careful to acknowledge the difference in standard of care doctors often provide patients between the different settings. Ramgopal said she’s been surrounded her entire life by people who could have benefited from the nurturing care provided at Allegheny Reproductive. Depression runs in her family, and she particularly notes how women in her life “never had true bodily autonomy” — part of her motivation for going into women’s health care. “We never talked about it until my brother was 8. I was 10. We became [their] therapists,” she said. She and her brother didn’t have it easy at school either. They were two of three people of color in their entire Episcopalian private school district in Oklahoma City until she was at least a junior in high school, she said. Her Hindu parents, however naive, thought the Christians wouldn’t give them a problem. “I was literally told every day by three people, ‘You do not believe in Jesus, you are going to hell,’” she said. So when she applied and was accepted to the University of Rochester for her undergrad, she couldn’t have been happier. For her parents, who immigrated to the United States from India before she was born in 1981, nothing could have been better than the scholarship she got. After suffering from seasonal affective disorder while a student at Rochester, she decided she had to transfer. She submitted applications to a few different schools and ultimately decided to transfer to the University of Pennsylvania. She fell in love with the city of Philadelphia but described the fine arts program there as “super malignant,” forcing her to explore her options. She took classes in nearly every department, eventually settling on dual majors in religion and biology. A lot of things in Ramgopal’s life have been malignant, she said. She has struggled with depression since she was a child, as has her brother. Her first suicide attempt was when she was 10 years old. But growing up a woman surrounded by women who were denied bodily autonomy, it seemed inevitable to Ramgopal that she would pour her energy back into other women as her own form of therapy. And making positive change seems to be her specialty. When the previous owner of Allegheny Reproductive, Dr. Robert Thompson, retired in 2015, she was practically forced to purchase the clinic. What he meant was there was nobody he was comfortable passing his legacy down to besides Ramgopal — and it’s a huge legacy. Allegheny Reproductive is one of the country’s oldest abortion clinics, and its current employees realize the gravity of their work. She has worked there for two and a half years, and her voice smiled over the phone when she talked about Ramgopal. Ramgopal said her next goal is to enable the clinic to provide abortion services up to Pennsylvania’s legal limit, which is 23 weeks and six days — two weeks later into pregnancy than Allegheny Reproductive provides the procedure. The risk of complication increases after 21 weeks and six days, but the goal isn’t too far out of reach. 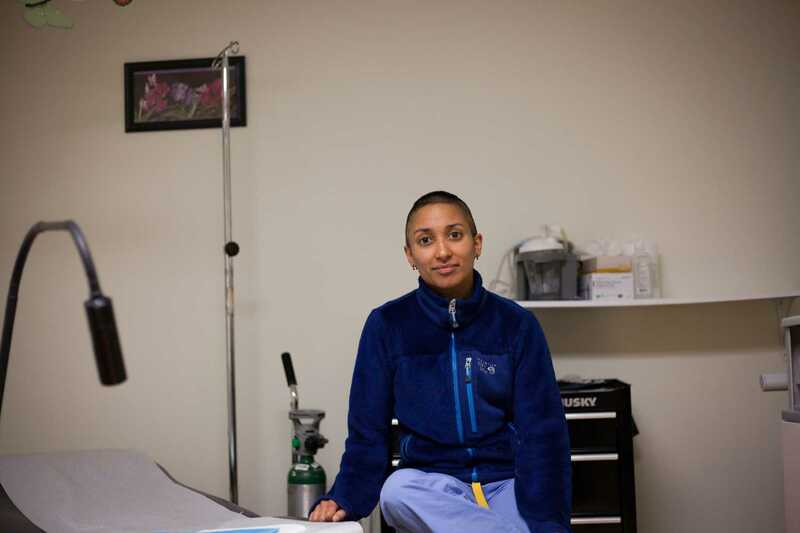 Allegheny Reproductive is certified to provide abortions up to the state limit, so for Ramgopal, it’s a matter of preparing her staff to be comfortable accepting that risk. She dreams of building a surgical unit within the clinic, as well as a labor and delivery wing. She envisions an entire clinic dedicated to transgender health care and wants to bring Pittsburgh its first genital reconstructive plastic surgeon. By the time she’s done teaching at Pitt, she hopes all students will undergo hormone administration training for transgender patients — a skill often neglected at medical schools. But now, Ramgopal is happy. She said she hasn’t felt truly depressed in more than eight years, and she loves spending her free time in her petting zoo of a home — she and her husband Harry Geyer own three dogs, two cats and two geckos, any number of which she will usually cuddle up with after a long day or night of work. She enjoys mountain biking at The Wheel Mill, which her husband opened in 2013 to fulfill his lifelong dream of opening Pittsburgh’s first indoor bike park. But despite this, she plans to keep working — providing patients that little bit of extra love and care they deserve. It’s just what she does.